Product code: ES7215 Categories: Antique, Antique Engagement Rings, Antique Rings. Here is a very lovely antique sapphire and diamond ring from the early 1900's that sits so well on the finger and thanks to the setting of the sapphires and diamonds makes it very practical to wear all the time. Made in 18ct gold, it is set with there Ceylonese sapphires that have long been regarded as the finest in the world, and these sapphires total 0.28 carats and are all so well matched for colour and transparency. Then set on each side of the centre sapphire, is not one but two diamonds to add that sparkle to the ring. These diamonds total 0.04 carats and highlight the sapphires so well and from one side sapphire across to the other side sapphire, this distance measures 13.9mm across by 6.3mm wide at the centre. Recessed down into the setting will prevent the stones catching on anything making it very practical and comfortable to wear all the time day or night and still get the attention it deserves. 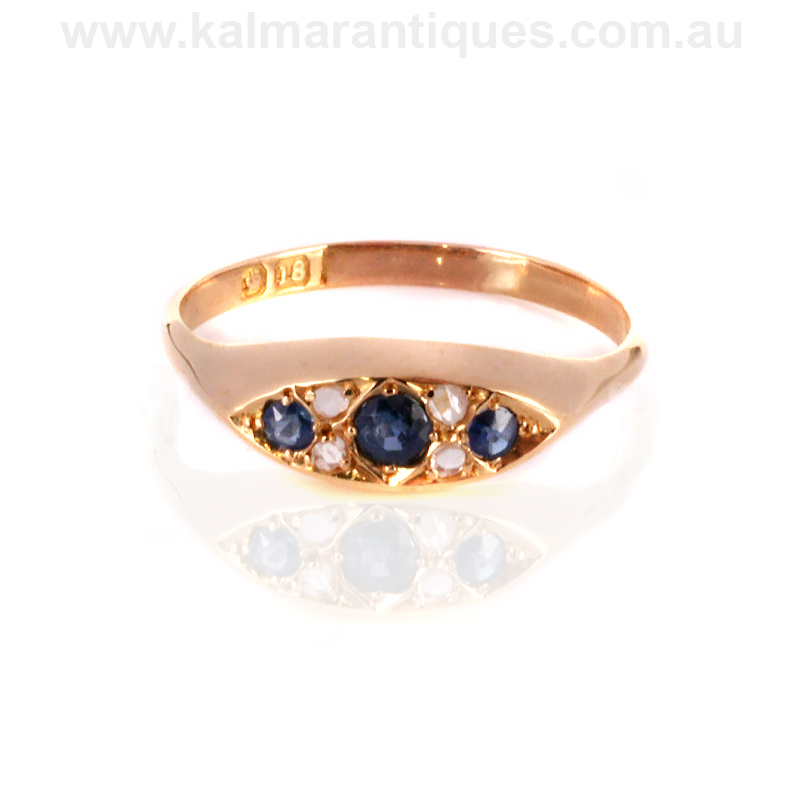 A very elegant example of an antique sapphire and diamond ring that will always be loved.